Canada’s prime minister, Justin Trudeau has commended Ethiopia for ongoing reforms, specifically the increase in number of women in key government roles. Trudeau, who spoke to Ethiopia’s prime minister Abiy Ahmed on phone, said his government is committed to supporting the ongoing reforms. Canada and Ethiopia enjoy cordial bilateral relations, cemented by development aid ($192.92 million in 2016-2017), trade worth $119m in 2017, and thousands of Ethiopians living in the Canada. Abiy, 42, has championed several reforms spanning across the political, economic, diplomatic and socio-cultural spheres, since taking office in April 2. 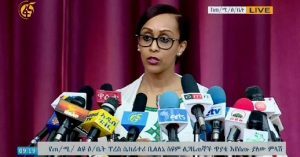 Having appointed a gender-parity cabinet last month, Abiy has since led the country to celebrating its first female president and first female head of the Supreme Court. The top female appointees, including the minister of peace, Muferiat Kamilhave since embarked on a nationwide peace campaign, which was launched on Monday. Despite winning praise for reforms implemented within a short time, Abiy’s government has struggled to contain inter-ethnic violence that that have displaced over 1.4 million people this year, according to the Geneva-based Internal Displacement Monitoring Centre. The office of the prime minister said Trudeau also expressed interest to visit Ethiopia.